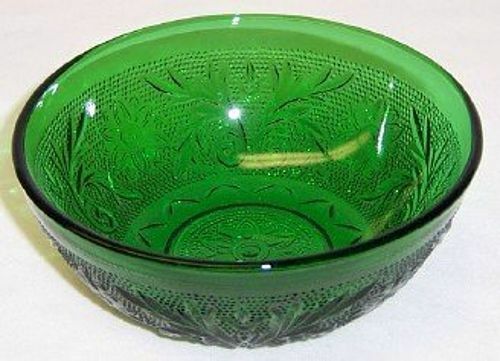 This is a pretty Forest Green Sandwich depression glass 4 7/8 inch Berry Bowl made by Anchor Hocking from 1939 to 1960s. This Bowl is in very good condition with no chips, cracks or scratches. 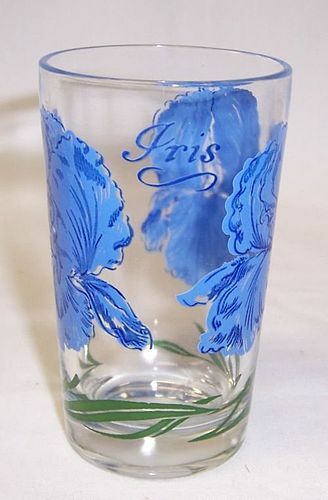 Be sure to search our other Sandwich glass available. We guarantee items to be as described. THANK YOU. 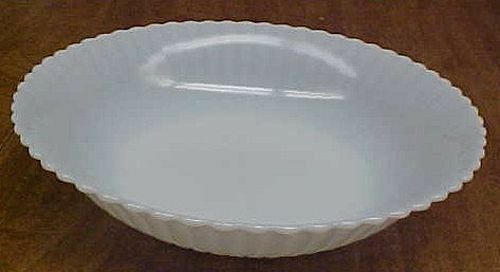 This pretty monax white Petalware depression glass Flat Soup Bowl was made by MacBeth-Evans from 1930 to 1940. This Bowl is hard to find. It measures 7 1/2 Inches in diameter X 1 5/8 Inches high and is in very good condition with no chips or cracks. 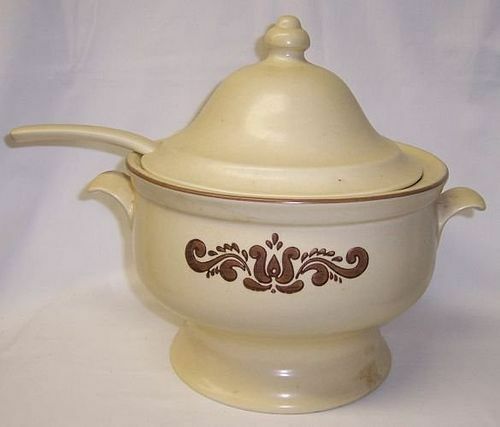 Be sure to search our other Petalware available. We guarantee all items to be as described. THANK YOU. This pretty Florette Monax Petalware depression glass Creamer and Sugar Set was made by MacBeth-Evans from 1930 to 1940. This Set is painted with the Florette with red flower decoration. Both the Creamer and Sugar are in very good condition with no chips or cracks. The painted decoration is all very good. 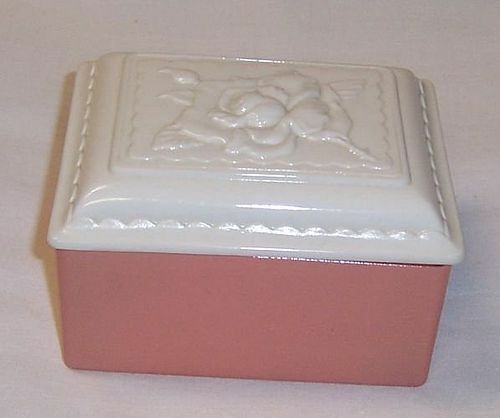 Be sure to search our other Petalware available. We guarantee all items to be as described. THANK YOU. This pretty pink American Sweetheart depression glass Cup and Saucer set was made by MacBeth-Evans from 1930 to 1936. The Cup measures 3 1/2 inches in diameter. The Saucer measures 5 3/4 inches in diameter. Both the Cup and Saucer are in very good condition with no chips or cracks. Be sure to search our other American Sweetheart available. We guarantee all items to be as described. THANK YOU. 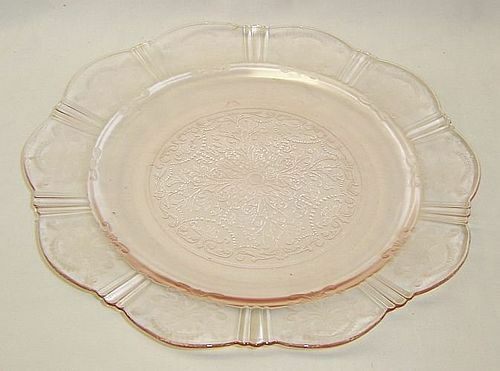 This pretty pink American Sweetheart 9 3/4 inch Dinner Plate was made by MacBeth-Evans from 1930 to 1936. The Plate is in very good condition with no chips or cracks. Be sure to search our other American Sweetheart available. We guarantee items to be as described. THANK YOU. This is a pretty crystal Waterford Waffle depression glass 8 1/4 inch diameter Large Round Berry Bowl made by Hocking glass from 1938 to 1944. This Bowl measures 3 inches high and is in very good condition with no chips, cracks or scratches. We guarantee items to be as described. THANK YOU. This is a really pretty green Moon and Stars Creamer and Sugar Set made by Smith Glass. The individual Creamer and Sugar measure 2 3/4 inches high. They are both in very good condition with no chips, cracks, or scratches. We guarantee items to be as described. THANK YOU. 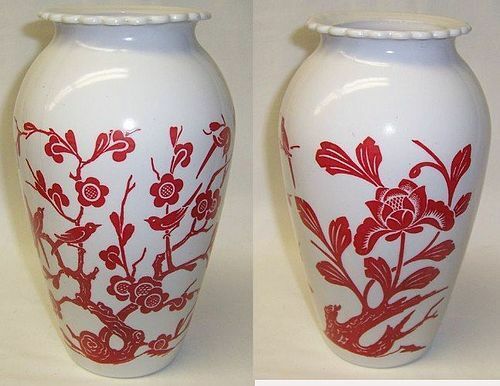 This really pretty Vitrock 9 inch high Vase, with Red Birds and Flowers, was made by Anchor Hocking. 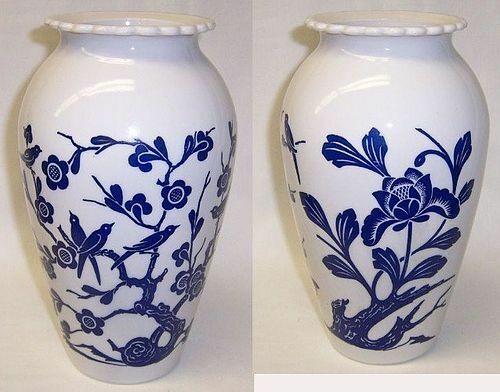 This Vase measures approximately 5 inches in diameter at the widest part. It is in very good condition with no chips, cracks or scratches. The bird and flower decoration is all very good. We guarantee items to be as described. THANK YOU. This is a really nice glass Rose top Dresser Box made by Anchor Hocking Glass. This Dresser Box Lid is ivory colored. The Bottom is a peach color. The Dresser Box measures 4 1/4 inches X 3 3/4 inches X 2 1/2 inches high. Both the Lid and Bottom are both in very good condition with no chips, crack or scratches. We guarantee items to be as described. THANK YOU. 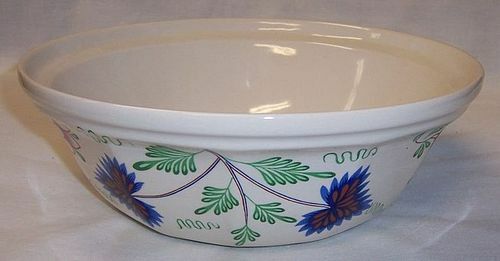 This really nice Greenfield Village Round Vegetable Bowl was made by Simpsons Ltd, England, an Affiliate of the Pfaltzgraff Company. This Bowl measures 8 1/2 inches in diameter X 3 inches high. It is signed The Museum Collection by Simpsons LTD England, an Affiliate of the Pfaltzgraff Co. Edison Institute GREENFIELD VILLAGE. This Bowl is in very good condition with no chips or cracks. The painted decoration is all very good. We guarantee items to be as described. THANK YOU. 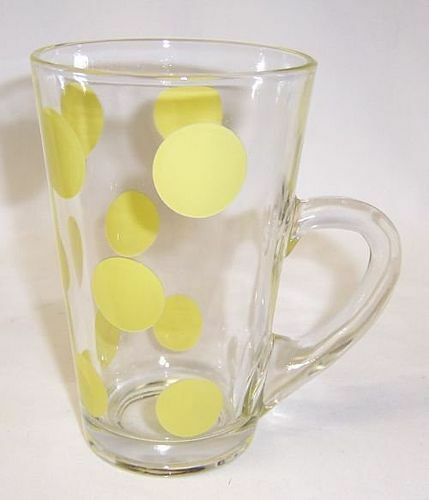 This is a really nice crystal with Yellow Dots 5 1/4 inch high Cone Shaped Handled Mug made by Anchor Hocking. This Mug measures 3 1/4 inches in diameter across the top and is in very good condition with no chips or cracks. The Yellow dots are all very good on the clear glass. Be sure to search our other Anchor Hocking glass available. We guarantee items to be as described. THANK YOU.